The Federal Government announced its intention to deregulate the downstream oil sector on the 27th of February 2009. Government’s decision to “hands –off” and allow full participation of the private sector, is mainly due to what it says is the un-sustainability of continued subsidy spent on the sector. Several interest groups have expressed reservations over the proposed plan for various reasons, which include an anticipated increase in the price of petrol and subsequent hardship for the masses. Despite the outcry, the Federal Government continues to reaffirm its commitment to deregulation of the sector. 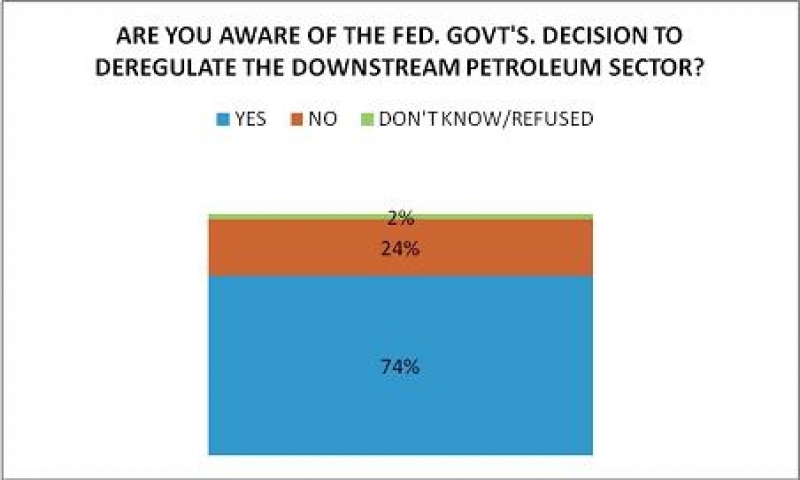 In a recent survey conducted by NOI Polls to assess public sentiments on the planned policy change, Nigerians were asked if they are aware of the government’s intention to deregulate the downstream oil sector and if they are aware that removal of subsidies is part of the deregulation process. 74% of the people surveyed said they are aware of the planned deregulation in the sector. This figure shows an increase in awareness levels from 58% in March 2009 to 74% in November 2009; however, awareness that removal of subsidies is a major part of the deregulation process was only 58%. 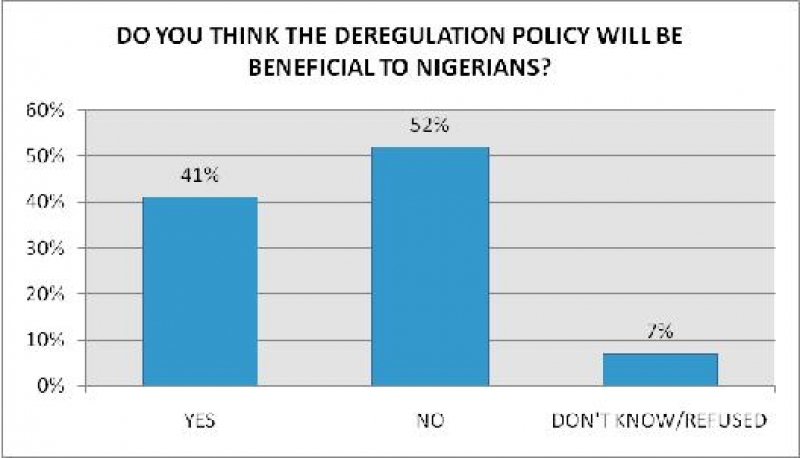 In addition, about half of the people (52%) who said they are aware of the planned deregulation ‘said they do not think the policy change in the sector would be favourable to Nigerians. This figure is significantly lower than the proportion (85%) who said the same, in a similar poll conducted in March 2009. The data indicates a marked change in opinions between March and November 2009. This might be explained by the increase in public debate over the issue. The Government estimates that it spends around N600 billion annually on petroleum subsidies, thus with the removal of subsidies, a substantial amount of money would be saved each year. In the poll, Nigerians were asked what they think the government should do with the money saved from subsidies on petroleum products. Investment in Infrastructure and agriculture (both 23% each) were the most common responses given by the people surveyed. 17% of the people polled volunteered investment in social services such as free health care, while 11% mentioned investment in educational reforms. These results are based on 1034 telephone interviews with randomly selected phone–owning Nigerians aged 16 years and older, across the six geographical regions of the country. The poll was conducted between November 13 and 19, 2009. With a sample of this size, we can say with 95% confidence that the results have a statistical precision of plus or minus 3 percentage points of what they would have been if the entire population had been surveyed. This poll is part of the ongoing snap poll exercise conducted by NOI Polls to rapidly assess public sentiments following various social, political or economic events. NOI Polls is a Nigeria-based opinion research organization which works in technical partnership with Gallup Polls (USA), to conduct periodic opinion polls on various socioeconomic issues in Nigeria.